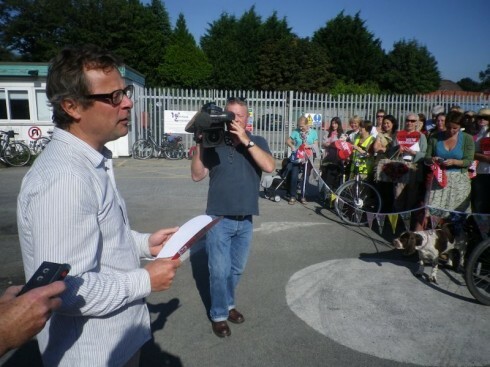 Hugh Fearnley-Whittingstall was in Totnes last week to throw his weight behind Atmos Totnes and to visit other Transition Town Totnes initiatives. Hugh is the fifth Patron of Atmos, joining Dr. Sarah Wollaston MP, Jonathan Dimbleby, Kevin McCloud and Tim Smit. 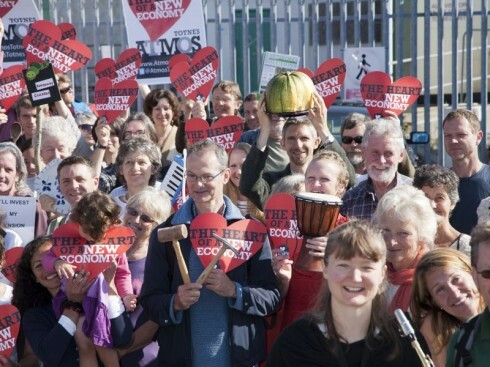 Atmos Totnes is working to bring the former Dairy Crest site adjoining Totnes station into community ownership to develop it as ‘the heart of a new economy’. It is currently negotiating with Dairy Crest, the site’s owners, for an Exclusivity Agreement for the site, a process that has entered a critical stage. 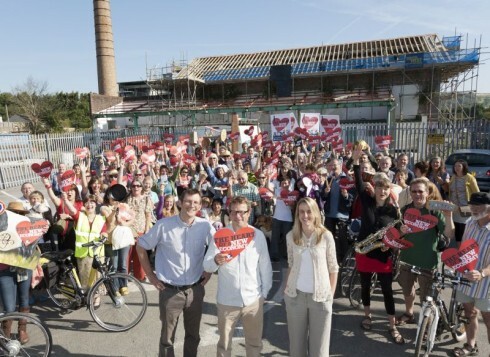 Hugh joined around 200 people in front of the Brunel building on the Dairy Crest site for a photo opportunity designed to give the negotiations a final push and a show of the level of community support for Atmos. People were invited to bring things which they felt represented what they want to see happen on the site. Objects brought along included electric bikes, frying pans, hand-woven bags, handmade furniture, a plank of local timber, home-made biscuits, gardening tools, grow-your-own gourmet mushroom kits, woodworking tools, an ‘I’ll invest my pension’ sign, a drum, a saxophone, a keyboard and, erm, half a huge marrow on a plate (see below). You can see more photos from the event here. 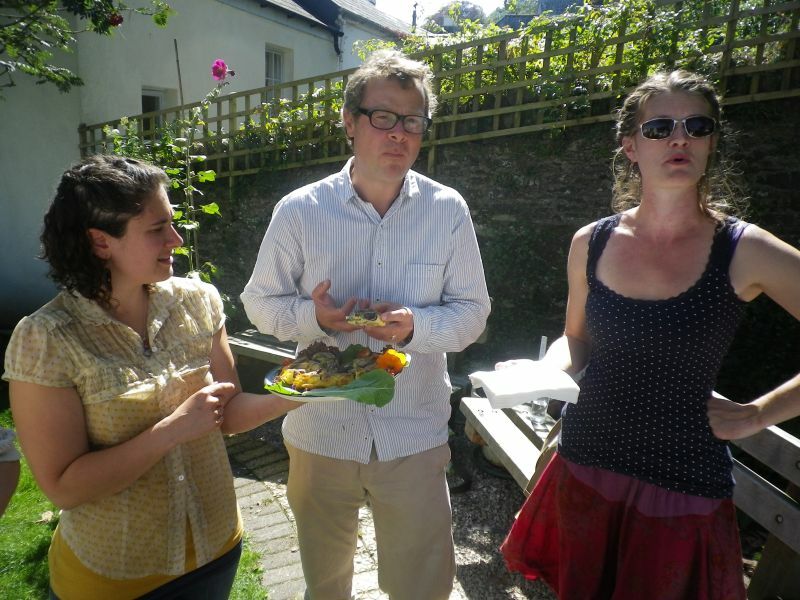 He then had a whistlestop tour of Transition in Totnes, led by Hal Gillmore of Big Green Canoe, who runs Transition Tours. 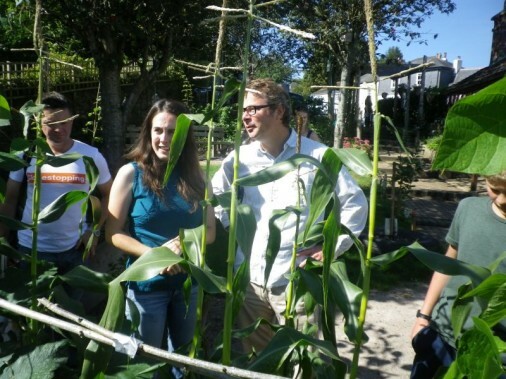 First he visited the Incredible Edible Totnes beds, newly installed on Totnes station, and heard from Larch Maxey and Wendy Stayte about the other ones around town, such as outside the Rugby Club and at Steamer Quay. … then, having visited one of the Transition Streets homes in Follaton to hear about that aspect of TTT’s work, he visited Totnes Development Trust’s Healthy Futures garden at the Lamb, where he was shown round by Jenny Gellatly. He then met with other members of TTT to hear about other aspects of their work, as well as meeting Sima and Hannah of The Kitchen Table, a local food social enterprise which has emerged from TTT, who presented him with a beautiful frittata made from local ingredients. Then he walked down to the Grove Primary School where he was due to help the school celebrate its new kitchen and catering approach. Our thanks to everyone involved in making this day a possibility, to Hugh and his family, to Jess, his PA, and to the sun for turning up. how brilliant that Hugh is lending his support to the Atmos Project. We have been supporting his Fish Fight (protecting sea stocks) for some time. How about getting the Atmos Project logo onto Hugh’s website, with a link to TTT and the Atmos details? TTT could also support the Fish Fight in return.